In 2014, I wrote a 4-part article for the Franklin County Historical Society’s “Crossed Keys Newsletter” about my trip to Slovakia to find my Pracser-Supena relatives. It was beyond expectations. One week from today we will be leaving for a return trip, so I wanted to post the story from two years ago. Following is part one. In the fall of 2014, my husband, Tom, and I took a trip to the Slovak Republic. These four articles will describe how I researched my family, planned our trip, what I learned about Slovakia, and what I learned about my family that still lives in that beautiful little country. I began studying my family genealogy seriously in 2010. My mother’s side was easy – they’ve been here forever and probably go back to the Pilgrims. My father’s side – not so much. I always knew that my grandparents “were not from here.” After all, no one talked with an accent like my grandmother’s. I was lucky enough to know her throughout my school years. But I was not smart enough to have asked her the questions that are now so important to me – about her family and my genealogy. She died in 1981. So I began my search with two pages of my mother’s hand written notes and my grandmother’s family photo. She is the one standing next to her father below. My grandmother, Marie Elizabeth Supena, was born in 1899 to Stefan and Maria (Fuscek) Supena. She was the eldest of four children who were all born in Nitra, Slovakia. It’s Slovakia now, but I grew up never knowing for certain. I had heard Austria, Hungary, Austro-Hungary, and Czechoslovakia. Wars and border changes can do crazy things to your family history. In 1918, Marie married Eduard Pracser, son of Josef and Gizella (Schvarcz) Pracser. They immigrated to Berwyn, Illinois in 1920 where she worked as a dress maker and he was employed at Kuppenheimer & Co. as a tailor. In 1921 my Uncle Joseph was born, and in 1932 my father Elmer came along. Unfortunately, Eduard died in 1947 of a heart attack, and Marie had to go to work in a factory to support herself and my father who was only fifteen. Marie’s brother, Stefan, also immigrated to the United States. He had one son, Ronald, but I don’t recall ever meeting this family. However, her two younger sisters remained in Slovakia, married and had children. 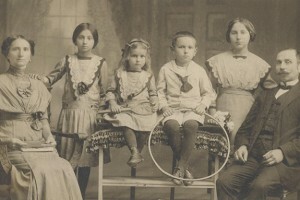 Could any of these children, my father’s cousins, be found? Were any still alive? And what about their children, my counterparts – the grandchildren of the Supena sisters? It was at this point that I needed to get serious about my genealogy if I wanted to have any hope of finding family in Slovakia. Genealogists know that you begin with what you know, so that’s what I did. At this point, I decided to concentrate on the SUPENA family, as there are still questions on my Grandfather Pracser’s side, ie., what was his real surname, was his father really adopted, what happened to Gizella and her daughter when they immigrated to the United States in 1923? My grandmother rarely spoke about the Slovak side of our family – or maybe I just didn’t pay attention; she insisted on speaking English correctly and assimilating into her new country. She flew back to her home country several times in the 1960s to visit her sisters and mother who stayed there, and she was always concerned about the political situation. There are few on-line sources when researching ancestors in Slovakia – FamilySearch.org is the best. My mother’s hand written notes listed my grandmother’s family members – siblings, parents, aunts, uncles with spouses and birth, death and marriage dates. But were they correct? I found a passenger list on-line for my grandmother’s brother, Stefan, that listed his home address in Nitra. When I Googled the address, a specific house was identified! I hired a researcher in Slovakia who found several new church records, but most importantly did the translations. Thanks to the internet, I did find where my great grandparents, Maria and Stefan Supena are buried. These were the only clues that I had to go on. In the next part, I’ll explain how I used these clues to prepare for my trip to Slovakia – and how I found Milan.